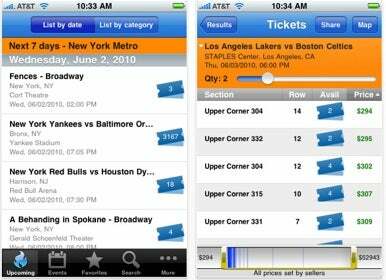 StubHub, an online marketplace for event tickets, has released its own free app for iPhone, iPad, and iPod Touch. The StubHub app lets you search and make purchases from the service's inventory of some six million secondary market—as in, resold tickets generally at a mark-up—sporting, concert, and theater tickets. The StubHub app includes many of the same features on the StubHub Website, such as access to search and purchasing functionality, seat maps, detailed ticket listings, and quantity and pricing filters. In-app purchases can be made using your existing StubHub account, PayPal, or by saving your credit card info within the app. While StubHub tickets often sell for far more than the original tickets—tickets for next week's Lady Gaga show at Madison Square Garden range from $149 to $3883—the application could be useful for last minute planners and travelers who want to buy in-demand tickets regardless of the cost. The app also makes it easy to plan your evenings by displaying upcoming events based on your location or by cities of your choice. It even includes social interactivity functions, letting you send event and ticket details via e-mail, as well as social-networking sites Facebook and Twitter. The icing on the cake is the StubHub app's integration with your music library, which lets you sync your favorite artists to the app in order to be notified when they're coming to town. StubHub is a free download and is compatible with any iPhone, iPad, or iPod touch running iPhone OS 3.1 or later.